Big government maintains that there are no such things as intelligent alien life forms, while evidence to the contrary abounds. There were 2,625 reported UFO sightings in 2000, 3,069 reported sightings in 2010 and 4,881 in 2017—all listed with the National UFO Reporting Center. Considerable speculation exists as to what the future holds when humankind formally meets up with alien races. Who’s to say whether they will be friend or foe. June 1947 – Private pilot Kenneth Arnold makes the first post-War UFO sighting at Mt. Rainier in Washington State. Arnold reported seeing 9 disc-like objects moving at an estimated 1,200 miles an hour information flying “like a saucer would if you skipped it across the water.” From this incident, the term “flying saucers” was born. July 1947 – The historic crash of a “saucer” outside Roswell, New Mexico, grabs the attention of Americans. Newspaper headlines announced the capture of a flying saucer by the army air force. July 1952 – Over a period of two weeks, UFOs were sighted by air traffic controllers at Washington National airport and separately by an airline captain over the city of Washington, DC. 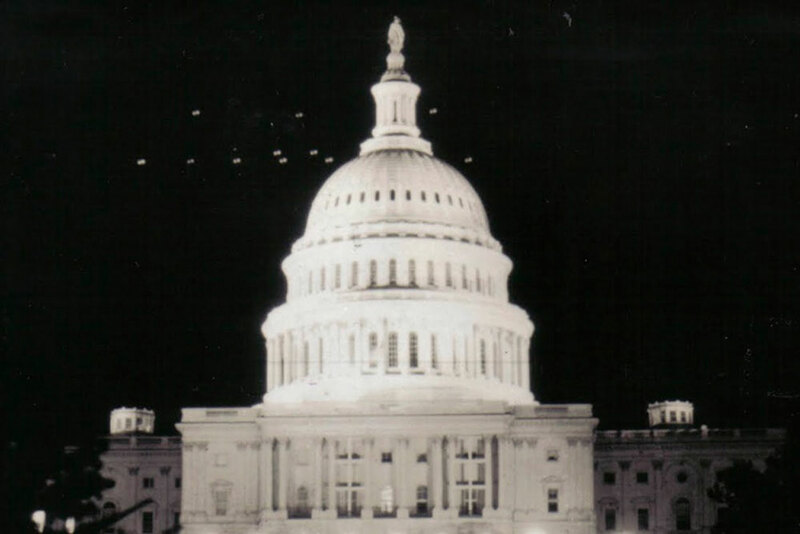 April 1966 – House Committee on Armed Services holds hearing on UFO evidence with an evident purpose of suppressing the subject in a highly controlled presentation. The request for the hearing had been initiated by the House Republican leader (and the future President) Gerald Ford. 1966 – Writer John G. Fuller publishes the book The Interrupted Journey giving the details of Betty and Barney Hill abduction by aliens. Excerpts of the book are published in Look Magazine. This is the first broad introduction to the general public of this phenomenon. December 1969 – The US Air Force’s study of UFOs entitled “Project Blue Book” is closed down. Initiated in 1952, the summary of its seventeen-year investigation is aimed at further negating the existence of UFO phenomena. November 1975 – While working in the White Mountains, Arizona logger Travis Walton claimed he was abducted by a UFO and underwent rigorous testing by aliens in their ship. His account was later made into the movie, Fire in the Sky (Paramount Pictures) based on Walton’s book, The Walton Experience. Summer 1977 – NASA sent two unmanned space probes into space to explore the outer reaches of our solar system and onward from there to deep space. These were Voyager I (Sept. 5, 1977) and II (Aug 20, 1977). After 40 years, they are over 10 trillion miles from Earth and continue to send data back to NASA daily. 1977 – The first reported account of “crop circles phenomenon” is reported in Alaska near the town of Eagle. In December 1978 a full account of the discovery was published in an article entitled “UFOs Terrorize Alaska” complete with sketches of the UFO “base camp” in Ideal’s UFO Magazine, issue #4. It is the first of many such sightings brought to the attention of the general public. December 1979 – Star Trek: The Motion Picture (Paramount Pictures) found Earth under attack by a foreign cloud called V’ger returning to its Creator which turns out to be one of the Voyager space probes returning home after being considerably enhanced by an electronics life form from deep space. December 1980 – Unexplained lights and a UFO are observed in the Rendlesham Forest by US Air Force personnel stationed at the Woodbridge RAF Base located in Suffolk, England. October 1982 – Battlefield Earth by L. Ron Hubbard, the first science fiction main-stream bestseller in two decades, is published. The novel is based on the premise of Earth in the year 3000, after having been overtaken by a ruthless alien race 1000 years earlier. The aliens learned of Earth and its valuable mineral resources from a probe they picked up in deep space that gave directions to Earth. November 1989 – Linda Cortile is abducted through the window of her New York apartment, an event that is witnessed by several people from the Brooklyn Bridge. July 1991 – Videos were taken of a disk sighted over Mexico City during an eclipse. The event was observed by multiple sources. August 1993 – A Titan IV rocket exploded less than a minute after takeoff at a height of 100,000 feet. The official explanation blamed the loss on a rocket motor segment. However, Air Force Colonel Frank Sterling, the Titan IV program manager stated an Air Force video of the launch showed an unidentified object striking the Titan IV just before the explosion. March 1997 – Multiple sightings of a “V” shaped cluster of lights above Nevada and Arizona. A CGI rendering of the object created by witness Tim Ley appeared in USA Today. August 2012 – The Voyager 1 probe enters deep space with its message to the stars carried on a gold disc while in December 2014 Voyager 2 enters the “heliosheath”—the outermost layer of the heliosphere. September 2016 – SpaceX’s Falcon 9 rocket being tested at Cape Canaveral in Florida exploded. SpaceX CEO Elon Musk said the rocket’s explosion was “the most difficult and complex failure we have ever had in 14 years,” and he added his team was not ruling out the possibility of an Unidentified Flying Object (UFO) striking the Falcon 9. For the full article, go here: “Alien Invasion: Is Earth Prepared?” Part 1.